Make sure you don’t miss Kunzay’s take. After taking a look at what makes for ideal leveling, this week I will be sharing my thoughts on the latest round of 12x XP in Star Wars: The Old Republic. When the return of the XP buff was announced the timing could not have been better. I had purchased the “Choose Your Path” promotion in March which meant my 60 days of sub time would run out shortly after the XP buff had begun, the perfect incentive for remaining a subscriber. I’ll admit, I was excited about the increase in leveling speed. One of my biggest pet peeves with leveling in MMOs is when it is extended unnecessarily in order to retain subscribers or to encourage the purchase of XP boosts. Or both. 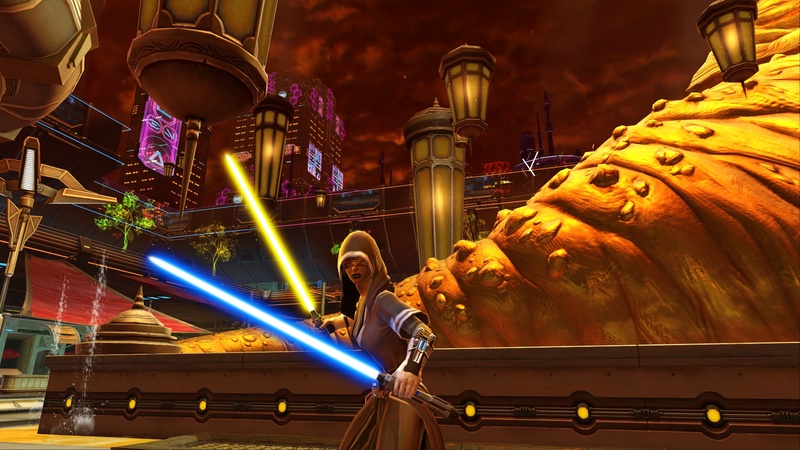 With the 12x XP buff in SWTOR, characters can be leveled by playing exclusively through the class stories. Not only does this make the process quicker, but it also emphasizes one of the stronger elements in the game: story. However there is a dark side to the XP boost, one that became readily apparent after a few days of playing at the accelerated rate. So today I’d like to list some of the pros and cons of having such an accelerated leveling experience and suggest a better solution. Let’s start with the good stuff. One of the things I look for when leveling in an MMO is for the pacing to be set by the story rather than by a need to prolong experience gains in order to keep players in game. So many MMOs have a ridiculous amount of filler content while leveling. As a result I often lose sight of the main storyline because it can be hours of gameplay stretched out over several days before I get back to the primary narrative. With 12x XP, the class story matches your leveling speed almost perfectly. Currently I’m level 50 and not quite through with my class storyline so it actually appears to outpace the story a little. I’m not sure if that’s because the buff outpaces the questing eventually or if I’ve participated in enough side activities (Flashpoints, Warzones, etc.) to have pushed myself ahead, but whatever the case it’s close enough. Because of the XP multiplier I could navigate from one quest to the next without needing any filler projects to move forward. As a result I was actually able to follow (and enjoy) the Smuggler class story. Secondly, the accelerated pace of 12x XP works well with the time I have available to play MMOs. Normally I would have to play a game exclusively for weeks on end in order to make any kind of progress toward end game however with the buff I am able to play SWTOR 2-3 days a week and still feel like I’m moving forward at a fair clip. This may be a personal character flaw, but there have been times when I have moved on from a game because the leveling process simply took too long and I began to feel like I wasn’t accomplishing anything. With a limited amount of time to devote to gaming and an interest in two or three titles at a time it is in my favor to make tangible progress with short play sessions. There’s really only one problem with the XP boost, but its significant enough I may turn it off when I start leveling a second character. After a couple of days of speedy leveling I grew disinterested and started playing far less. This was partly due to the fact that I started playing Marvel Heroes and Trove again, but it also had to do with the lack of variety in my play sessions compared to when I first started playing SWTOR. For the first 35 levels of SWTOR I spent my time in Flashpoints, Warzones, Galactic Starfighter, and questing equally. Yes, this broke up the questing and storyline a little but it was at my discretion and kept the gameplay interesting. However once the XP boost was in place I avoided these other activities because the XP rewarded was marginal compared to the class story. Yes, I could have continued to pepper my play sessions with the occasional Flashpoint or Warzone and perhaps the second time through I will, but it’s hard to argue with efficiency when your goal is to reach the new Shadow of Revan content. For now I’m going to press on with the class quests and mostly ignore other activities so that I can get to Yavin, Rishi and Ziost but with subsequent characters I am going to either turn off the XP buff or try breaking up the class quests with other activities and not worry about out leveling the zones. I may also I try turning the buff on at times and off at others and find a happy medium. Regardless, I don’t think I could level another character using only class story quests. Instead of the semi-permanent 12x XP boost I would prefer the double XP that Bioware has offered in the past for short durations. What I like about the double XP event is that every activity gets a small XP boost which means you can continue to play diversely but a little more quickly than usual. For the most part you are able to play through the planetary quests, class quests, and a few other odds and ends without drastically out-leveling content. Even if you do get ahead you can easily get your character level back on track because of the short duration of the event. In other words, I prefer things the way they already were, though perhaps with more frequent double XP events. There’s one other alterative, one I don’t actually expect to happen in SWTOR or any other traditional MMO. That option would be for studios to make a drastic shift away from vertical progression and introduce new content that is playable by characters of (almost) any level. Lately I’ve been playing a lot of Trove and Marvel Heroes and the feature I appreciate most in both of these games is that “end game” or the equivalent is introduced midway through the leveling process and scales in difficulty with your progression. 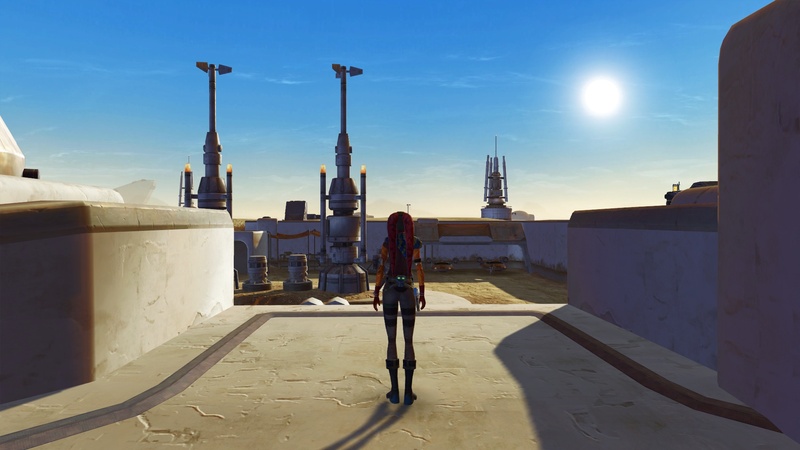 The whole reason I am in a rush to reach 55-60 in SWTOR is because I want to see the most recent content while it is still current. If I could somehow participate in the latest patches while I level I wouldn’t be in such a hurry. World of Warcraft made an attempt at this with the instant level 90 boost. 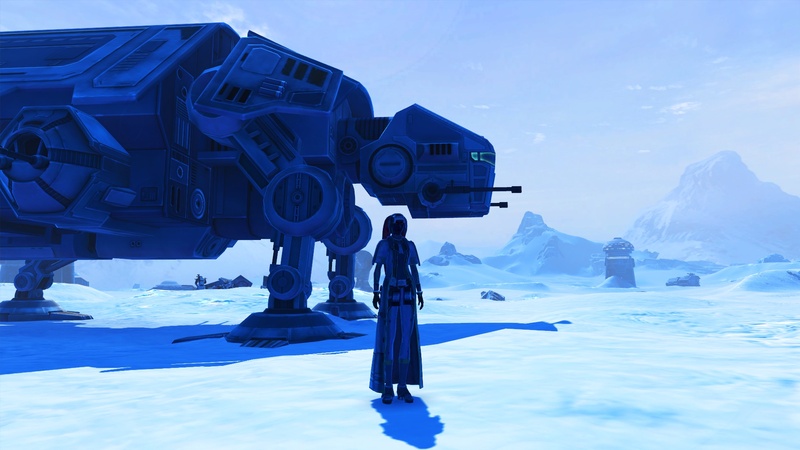 SWTOR is using an XP boost as a means of catching up players. But neither is the best solution; yes, they allows new players to experience current content rather than waiting months to reach the appropriate level but it devalues all of the old content in order to do so. Personally I like leveling as a benchmark of character growth, so I don’t want it to go away all together. What I would like is for characters or content to scale so that after a few tutorial levels (like the first 10 in Trove) I can continue leveling anywhere in the world. Unfortunately that’s just not possible with a linear, story driven MMO like SWTOR. So is 12x XP a good thing or not? I would argue that it serves its purpose so in that sense, yes it is beneficial. However I think it’s a fix applied to an outdated system; the system itself should be better. The issue isn’t whether players should have the option to bypass so much content by leveling quickly, the problem is gating content by level in the first place. Some gating is necessary in order to give players time to familiarize themselves with a class (tutorials) or to allow studios to do some linear storytelling. However both should be done sparingly so that players can move more freely from zone to zone, story to story, expansion to expansion, growing their characters in power without being limited to a single linear path that takes a hundred hours to complete. 12x XP is a wonderful band aid, but it’s still a fix applied after the fact. I would rather see more games like Trove and Marvel Heroes or even Guild Wars 2, where character level is still a mark of progress and relative power but not a gate restricting players from new content. Remove the gate and there will no longer be a need for XP boosts. 3) PvPers that want to level up (PvP gives very low XP rewards). I think it’s good to offer the option to turn it off for those that don’t want to level quickly. That said, I totally agree in that it’s a shame levels are so restrictive in the game. I’m still hoping levels in games like Guild Wars 2 (and apparently Trove, which I don’t play) are going to be the future. Me too! Trove doesn’t scale you like GW2, but because each map is procedurally generated and more or less has the same chance of spawning the various biomes you’re still getting the same experience regardless of level only with an increase of difficulty. GW2 or even Rift are better because they have ways for low level players and high level players to play together. Rift even lets low level characters scale up. I think it’s one of the only games to do so. I think the problem they had with things like double XP weekends in the past is that for some reason a lot of players felt compelled to use them to maximise their “XP per hour”, which resulted in things like people chain-running the Kuat Drive Yards flashpoint thirty times in a row (I didn’t experience this myself but saw acquaintances and guildies fall into this trap). Then those same players would feel burnt out afterwards because the whole experience wasn’t fun and everyone else would face-palm. I’m guessing that at least part of the motivation behind the whole 12x XP initiative was to protect people from themselves by nudging them towards working on content that’s actually engaging. That makes sense. I had heard that before about KDY, but have never approached the double xp that way myself. I’ve heard players suggest gating 12x behind a legacy perk and I think that’s a smart idea because it does seem geared towards repeat players already at max level with at least one character. As a catch up mechanic for a brand new player, it’s probably not the best. Then again, that has less to do with the mechanic and more to do with me as the player. No one is forcing me to play only class stories, I just choose to for the sake of efficiency.